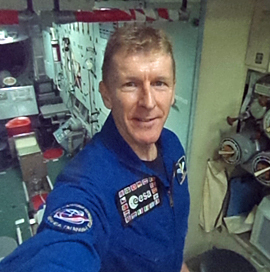 What's it like to live on the International Space Station? There are currently seven billion people living on Earth. Although our lives differ in countless ways - almost all of us share some common experiences. Each day we all do things so routine we don't even think about them; such as raising our heads from the pillow each morning or maybe looking for something to put on our feet before taking the first few steps of the day. These experiences of living and moving through the physical world are shared by everyone. But there are six people out of seven billion whose daily experience sets them apart. These six are floating 400km above our heads in the International Space Station. Their daily routine is both recognisably the same and also utterly different from ours. For a start, they don't need slippers. 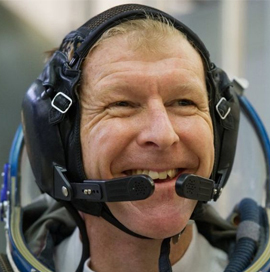 The British astronaut Tim Peake is about to become one of them. Tim Peake will sleep in one of the four sleep stations in the Harmony module and his day on the space station starts when the lights are turned on by mission control at 6am. This is the sign for the crew to get up. Though terms like "up" and "down" are all relative when you've spent the night floating in a sleeping bag inside a small cubicle on the ceiling. Once you've woken up, the day starts the same as it would on Earth, with a trip to the bathroom. It's with small details like brushing your teeth that the oddities of living in zero-gravity become clear. The toothbrush and the toothpaste can be left to float in the air and the water sticks to the bristles of the brush – but where do you spit when you've finished? Next you grab some breakfast and the crew call down to mission control for a planning conference to run through the day's schedule. Then it's time for household chores. 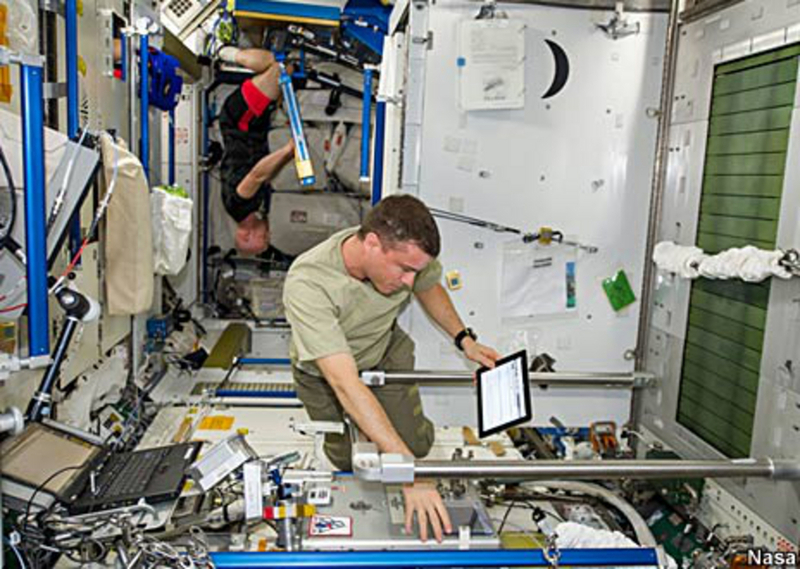 The space station requires routine maintenance and safety checks on most days. 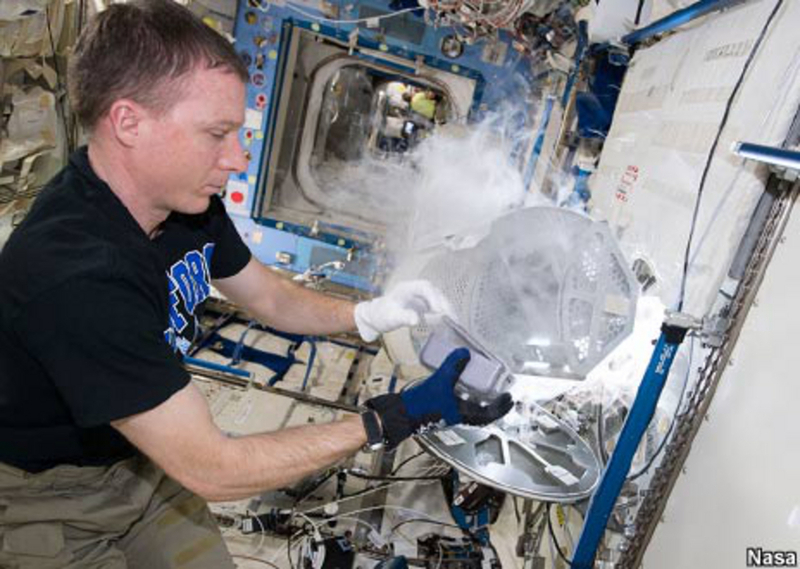 One day it might be disinfecting surfaces or moving some supplies, another day could involve repairing an essential piece of equipment like an air filter on the Destiny module. Almost every task on the station is carefully scripted and astronauts have a schedule list written by teams at mission control setting out every activity, step by step. Even so, things still sometimes go off-track. In particular, most astronauts spend their first few days on the space station losing stuff. Everything they use has to be constantly secured using one of the many pieces of velcro, clips, magnets, duct tape, or elastic bungees. Floating around the station might be fun but it also poses a long-term risk to the health of the crew. 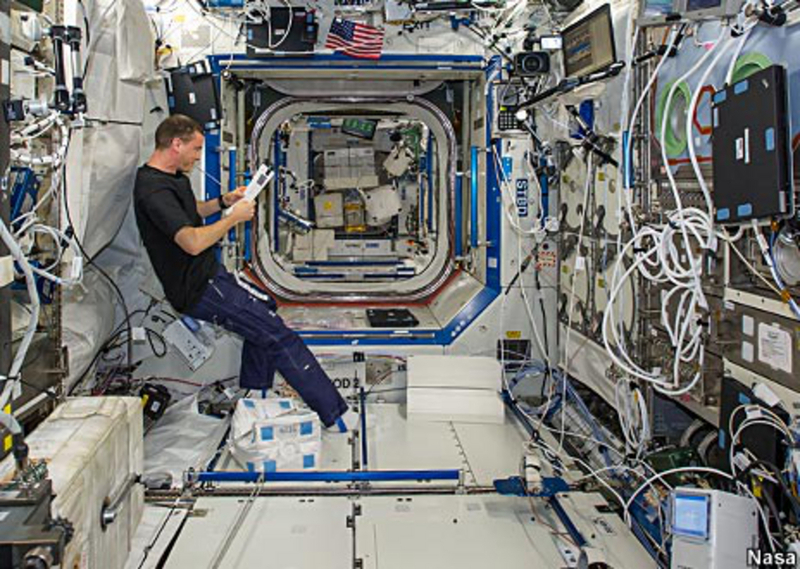 One of the main aims of the space station is to discover what the effects of zero-gravity are on our bodies. This kind of knowledge will be essential if there is ever a mission to Mars. What we already know about living in orbit is that the lack of gravity makes astronauts' bones more brittle and moving is so effortless that they also begin to lose the strength in their muscles. To slow this process down, each crew member is required to exercise for at least two hours a day. There are three pieces of equipment to work out with: a treadmill, an exercise bike – without a seat as you can't sit without gravity – and the Advanced Resistive Exercise Device (ARED). ARED, in the Tranquility module, is the most recent addition and is a weightlifting gym that uses vacuum tubes to work without weights. The week in space is still divided up into weekdays and weekends. During the week each astronaut follows their own schedule and, while they may work in pairs or small groups on some tasks, it rarely allows for the whole crew to eat their lunch together. The exception to this is Sunday when they will often come together to float around the table and enjoy a shared meal. 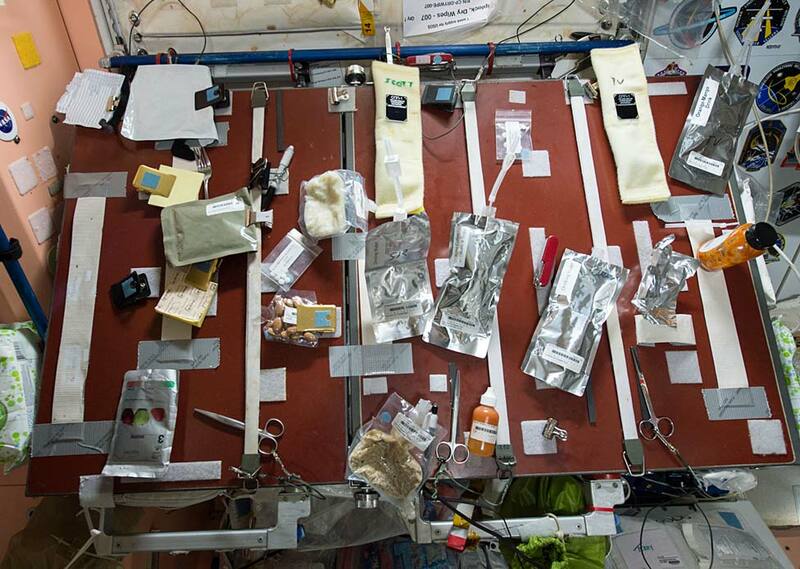 Food comes in several forms on the space station. Dehydrated meals come in pouches to which hot water is added before eating and Russian cosmonauts still receive tinned foods that can be heated in the can before opening. The original table in Zvezda has special compartments for heating cans. Sauces like mustard, ketchup and hot chilli are all available, just like on the table back home. But the salt and pepper have been transformed into liquids, otherwise the station would be full of floating granules of salt. 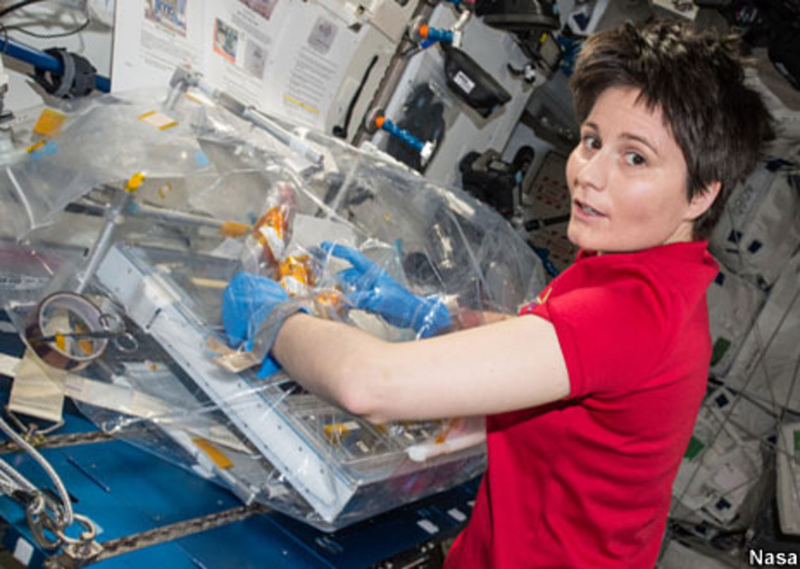 The crew also look forward to the fresh fruit that is sent up with each cargo mission, though it doesn't keep any longer in space so it has to be eaten fairly soon after arriving. Deliveries of fresh food and events like group meals and celebrations are important for morale among the crew. Looking after moral is a high priority for mission control, because the fact is, as exciting as it is to live in space, a lot of the daily routine can be repetitive and even boring. No-one dreams of being an astronaut so that they can fill in checklists, but that is a larger part of the job than you might imagine. The main purpose for the existence of the ISS is to act as a unique scientific research laboratory and each astronaut spends part of their day as zero-gravity lab technicians for scientists back on Earth. Astronauts discover the experiments that they will be working during the final stage of their training and will have spent time practising with the equipment before going into space. There are five laboratory modules on the space station: Russia has two Mini-Research Modules; the US lab is Destiny; Columbus is run by the European Space Agency; and the most recent lab is Japan's Kibo, including a platform which allows experiments to take place outside the station. The experiments the astronauts set up and record cover a wide range of disciplines. There have been experiments looking at the effects of zero-gravity on different types of materials, on living cells, on small explosions. The station is also a good place from which to study the Earth by taking different measurements and images over time. Mice, ants, fish and worms have all been sent to the station to see how zero-gravity affects their bodies and behaviour, but probably the most frequent objects of study are the astronauts themselves. One of the most important aims of the space station is to discover what the long-term effects of zero-gravity are on the human body and to help plan for longer space missions, including to Mars. Space agencies are also testing out new technologies that will be needed for such missions. Sometimes the job of maintaining the ship becomes a little more challenging - for instance, when the part that needs repairing is on the outside of the station. Extra-vehicular activity (EVA), or a "spacewalk", is not a regular part of life on the space station but it can be among an astronaut's most memorable moments in space. It's also one of the riskiest and is planned in minute detail for up to a month in advance. Just getting the suit on takes four hours as the astronauts run through a safety checklist that is almost 100 pages long. The most obvious precaution is that all EVAs are done in pairs. So if one astronaut runs into difficulties, the other is there to help out. Once outside the station, the two astronauts could spend up to eight hours going through a series of tasks. They will have spent many hours practising similar tasks underwater on Earth on a model of the ISS that sits inside a giant water tank. The view from the actual station is a little more thrilling though. Once they have finished their scheduled tasks for the day, the crew are free to spend any remaining time in the evenings however they wish. Astronauts are able to call or email their families from their sleep station, read or watch movies. Recent film screenings have included Gravity and The Martian. 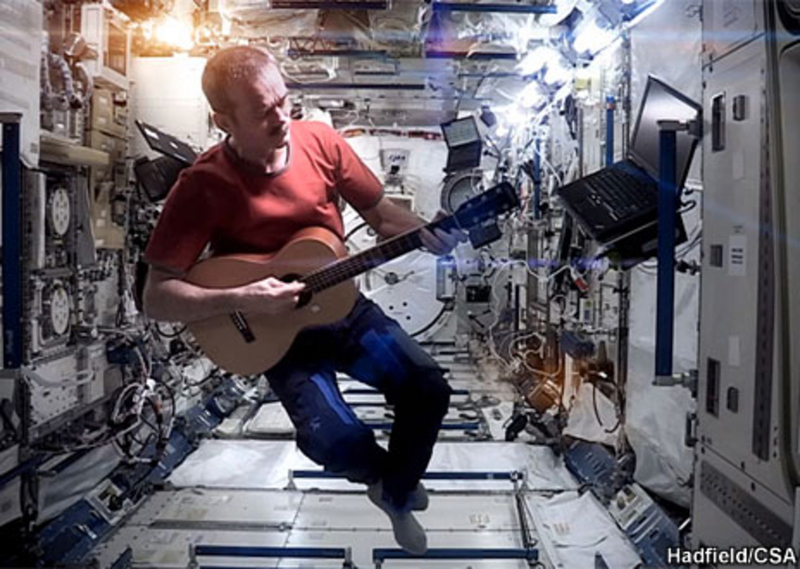 Chris Hadfield became one of the most famous astronauts for many years after playing guitar and even making a music video. He also became a celebrity on Twitter and since then it's become a popular way for the crew to communicate with a wider audience back on Earth. Probably the most popular pastime among astronauts is just watching the Earth spinning beneath the station from the cupola on the Tranquility module. Astronauts continue to share these moments with us through their many incredible photographs of cities, forests and weather systems - photos which are uploaded to the internet in their cubicle before they drift off to sleep floating 400km above their friends and family. Production: Gerry Fletcher, Janet Jones, Paul Sargeant. Code: Marcelo Zanni. 3D model: George Spencer and Marcelo Zanni. Commissioned by Paul Rincon. Video and images: Nasa, European Space Agency, Canadian Space Agency. Rosetta: Can you land on a comet?